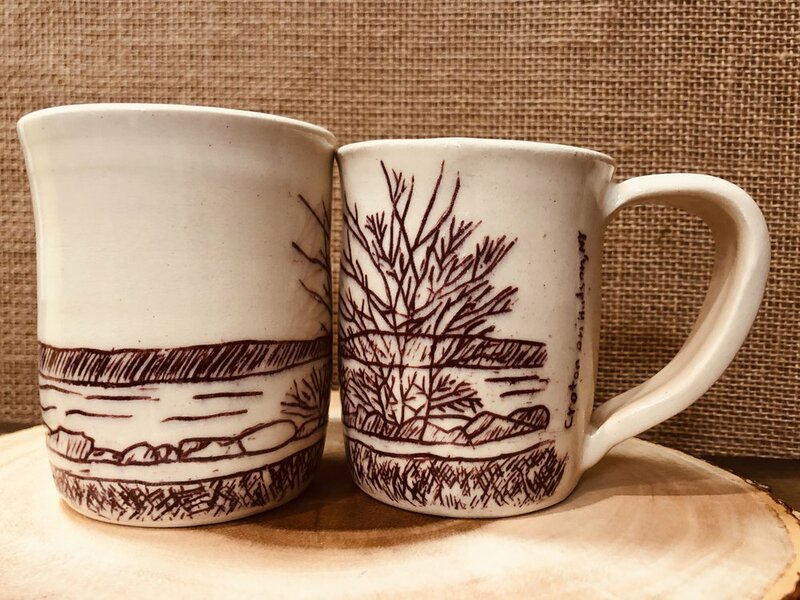 Orit Daly —a Croton-on-Hudson potter— introduced herself to us last year, correctly thinking we’d be in love with her line of botanical pottery. She takes plants in various stages (and seasons) and then imprints them in her art. Obviously Upper Village Blooms was smitten with this idea! After spending some time together with Orit, we realized we had a lot in common. Specifically, we love plants and flowers and we ❤️ Croton! We commissioned her to create bespoke art celebrating the natural beauty of Croton. After agreeing, she then asked —What if we make something useful as well? A fruitful and creatively collaborative partnership was born! We now present our Riverwalk Collection, three designs of our beloved Croton Landing, available in mugs and trivets. The trivets can be used practically, and when not in use it hangs on the wall. 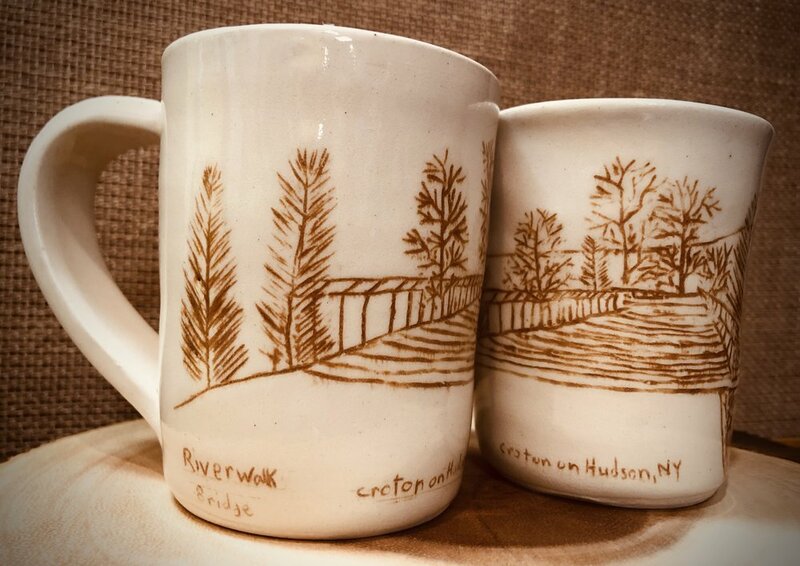 Orit’s line drawings of the Riverwalk capture the stark beauty of the Hudson River in winter. The slats of the walkway, curves of the path winding along the riverbank, and the graphic beauty of nature all represent our particular claim to the Hudson. The method in which Orit captures her art on our mugs and trivets is called the Mishima Technique. It originated in East Asia in 9th century Korea, then it travelled to Japan where it got its name. 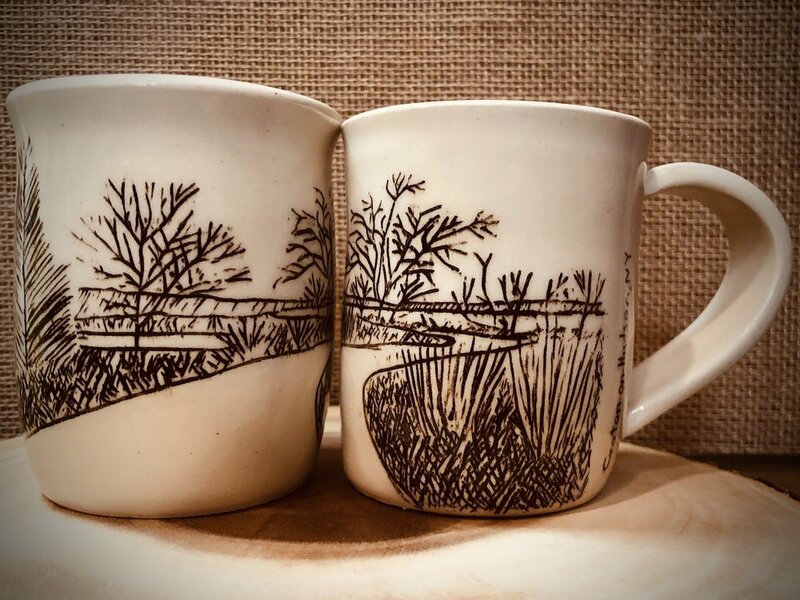 This method of incising and inking images before the glaze is applied perfectly evokes the linear aspects of Riverwalk in winter, with narrow-leaved cattails, reeds, willows, oaks, and the Palisades. Stop into Upper Village Blooms and admire Orit Daly’s work, then have a lovely stroll on our Riverwalk! Orit Daly from Little Light Pottery presents her Riverwalk Collection exclusively at Upper Village Blooms.